Scotia, poetic name of Scotland, is located on the east bank of the river in the beautiful North Loup Valley. It reminded Samuel Scott of his homeland, so he gave his post office the name and later gave the town site to the people of the county when it became the Greeley County seat in 1874. For over 50 years, Scotia had the only chalk mine in the state. During its operation, many carloads of chalk were shipped to Omaha for processing. The rock was used in 71 different products including paint, chalk for blackboards, feed, roadbeds, etc. Many early houses and two of Scotia's early buildings were built of chalk-rock, one of which is still in use today and listed on the National Register of Historic Places. The slogan "Chalk One Up For Scotia" was introduced to promote the town. Pieces of chalk with the history of the chalk mine were packaged and are sold as "A Piece of the Chalk." Funds raised are used for town projects such as the lighted cross on Happy Jack's Peak, once a lookout point for the Indians, later named for the Indian scout, Jack Swearengen. 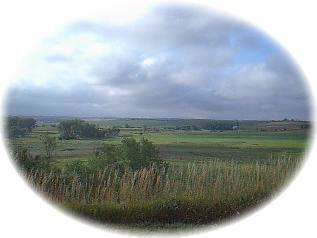 From this peak one can see for miles around and the lighted cross is a beacon to all entering the North Loup Valley. In 1883, the Union Pacific extended a branch line to North Loup on the west side of the river in 1883, bypassing Scotia. Freight and passengers ferried across the river until a bridge was built the next year. A spur was added requiring trains to back in to town -- our claim-to-fame, until the spur was abandoned. Scotia fell upon hard times with the loss of their primary source of prestige. The courthouse, built in 1887, stood empty and prominent families moved to Greeley. Scotia's population decreased until, with abundant faith in the future, the courthouse became a normal and business college which thrived until the drought and depression of the 1890s. With the loss of state aid, despite much lobbying from Scotia and the North Loup Valley people when funds went to York's normal college instead of Scotia, the school closed. The building was acquired by the Ben Hur Fraternity for a time. During WPA days, the building was torn down and a recreation center was built from the lumber. When the weather moderated and crops became more abundant, Scotia rallied. The population increased to nearly 600 in 1920, and it became a wealthy residential town. Today business are expressing faith in the future again. Scotia joined the Community Improvement Program in 1969 and in 1970 won first in its division for building a swimming pool without any state or federal funds. Cost-sharing help was received for low-cost housing units, appropriately named "Chalk Hill Manor." Organizations and individuals helped with landscaping, lawn furniture, etc. The town and rural fire departments worked together to secure a rescue unit when Scotia was without a doctor and lost its pharmacy. The community, businesses, organizations, and individuals contribute to the funds that keep this unit ready to respond to emergencies night or day. The current population is about 350 as retired farmers continue to move into town. There are six active churches in the town and surrounding area, and a business district that includes most of the essential services for the community. Our school is consolidated, with the elementary school in North Loup and the junior-senior high students in Scotia. Activities center around church, school, 4-H, extension clubs, and community activities. Whoever said "there is nothing to do in a small town" never visited Scotia. In early June, when the grass is greenest and the town is at its best, the Scotia community hosts an annual open-pit barbecue. As long as everyone works together, our town of Scotia will survive. By Joan Meyer, Scotia, NE 68875.